I have managed to start preparing for several holiday events. The first is the 2nd annual haunted garden tour at my work. 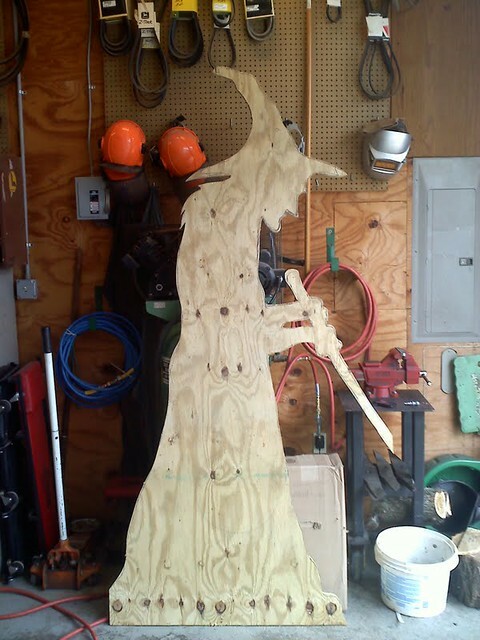 One of the staff has traced out several things that need to be cut out and I got the first of three witches cut out and half of a second one. Here is the first. They will all be painted black to be used as silhouettes. I have to admit I had a lot of fun with this one and look forward to the other two, not sure yet about the smaller cats. I will post all of them once they are finished. Since I like doing this last one I am pushing around making a Christmas type one for my house.. we’ll see. I also started to work on some games which I look forward to trying my hand at selling in November at the first craft fair I am going to try. It’s ran by our HOA and free to enter so I do not have a lot to lose. I’ll be posting some of the finished projects as we get closer. My wife and I are basically going for a game type theme, so I am making some Tic-tac-toes, some of those Ox-Yoke Puzzles, solitaire games and some other small challenges. Let me know if any of you have tried to sell any games and what may have been a good seller. Talk to you all next week, have a good week in and out of the shop. That’s one mean looking witch. By the way…how do you pronounce your name? Kleeb? Clibe?